China’s entry into the World Trade Organization in 2001 was touted as a win-win development that would benefit both the U.S. and Chinese economies. Almost a decade later, it is clear that American workers have suffered significant losses. In a new paper, EPI International Economist Robert Scott calculates that 2.4 million American jobs were lost between 2001 and 2008 as a result of increased trade with China, and that those job losses have occurred in every U.S. state, Congressional district, and most industries. The Figure below shows the job loss by state as a portion of total state employment, with the darker shades representing the most severe job loss. 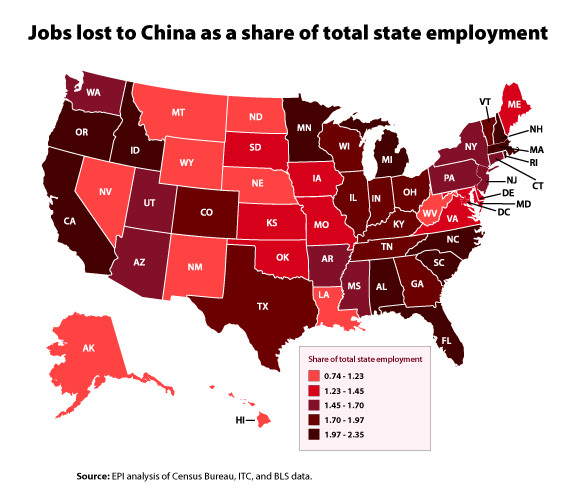 California, which has lost 370,000 jobs as a result of this trade imbalance with China, has suffered the largest total job loss, followed by Texas, New York, Illinois, and Florida, which all lost more than 100,000 jobs to China between 2001 and 2008. Measuring job loss as a share of total state employment, New Hampshire lost the most jobs, followed by North Carolina, Massachusetts, California, and Oregon. The 16,300 jobs New Hampshire lost represent 2.35% of total state employment. Scott’s paper also tracks job loss to China by industry and shows that the most jobs have been lost as a result of growing imports of computers, electronic equipment, and parts. The paper shows that Chinese currency manipulation— which has kept the value of the Chinese yuan low even as its exports have surged–is a major factor behind the widespread job loss. Although the rapid growth in a Chinese middle class was forecast to result in a large increase in U.S. exports to China, that growth in exports to China has not materialized. For more information on the jobs lost as a result of this trade imbalance, read Scott’s paper, Unfair China Trade Costs Local Jobs. For more information about the American manufacturing sector, visit EPI’s Economy Track.